From Monday 9 - Thursday 12 April 2012, Shanghai will host the first ever exhibition dedicated to the future of sustainable building, design, construction and the built environment in China. The inaugural Ecobuild China Expo & Conference will be held at the Shanghai Kerry Hotel and Shanghai New International Expo Center. 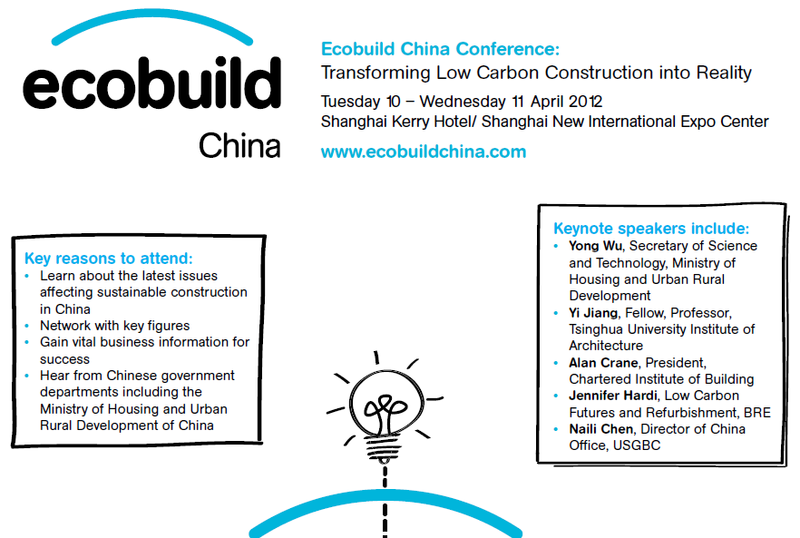 My partner Jennifer Hardi, a senior consultant at Building Research Establishment (BRE), will be presenting at the Ecobuild China Conference in Shanghai Kerry Hotel and Shanghai New International Expo Center. As the lead BRE keynote speaker, she will be part of a panel on Tuesday putting forward the case for BREEAM standard on behalf of the UK. Representatives of China's three star system, USA's LEED standard and Japan's CASBEE standard will also be joining her on stage in this panel, where they will debate the strategic development and concepts of green rating systems. 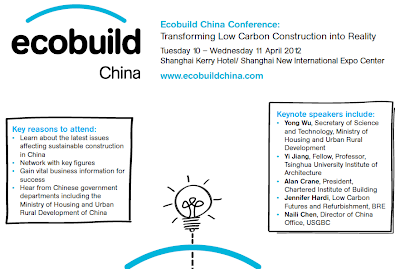 On Wednesday she will be also talk about Passivhaus standard and its progress in China as well as presenting the certificate for the first ever BREEAM assessed development in China. If you happen to be attending, do chat with her (she speaks both English and Mandarin Chinese fluently). In fact go follow her on twitter now!